One of the most poignant objects in Irish history is one that was deliberately and symbolically destroyed. The partly wooded hill of Tulach Óg (Tullaghogue), north of Dungannon in Co. Tyrone, commanding extensive views towards Slieve Gallion, was one of many traditional ritual sites on which communities gathered and kings were inaugurated. The Tudor colonisers looked on these sites with suspicion. The poet Edmund Spenser called them the resort of ‘all the scum of loose people’. The Tudors well understood the significance of Tulach Óg as the inauguration site for the O’Neill chieftains. 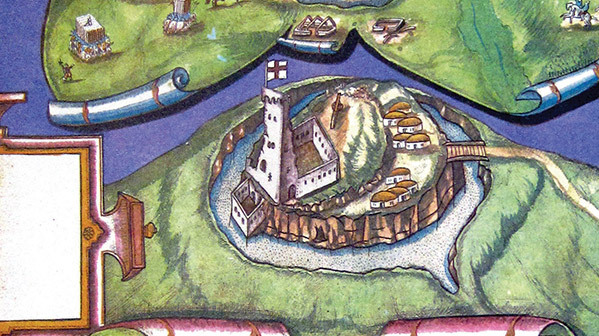 The cartographers Francis Jobson and Richard Bartlett marked it prominently on their maps of Ulster—Bartlett’s illustration is seen here. The focal point of the site was a rough-hewn stone chair called leac na ríogh ‘the flagstone of the kings’, which is first recorded in the annals in 1432. From Bartlett’s surviving drawing, it seems to have been made up of four pieces: a rough base (which may be the original stone) to which a back and sides were later added. This original stone may in turn have come from a part of the hill that was sacred as an ancient place of assembly. Archaeologist Elizabeth FitzPatrick suggests it may have been ‘adopted by Cenél nÉogain’—the ancestors of the early mediaeval Uí Néill—‘when they annexed the kingdom of Airgialla and established their new royal inauguration site at Tulach Óg in the tenth century’. Old O’Neyle is dead and the Traitour gone to the stone to receave that name. spoiled the corn of all the country…and brake down the chair wherin the O’Neals were wont to be created, being of stone planted in the open field. The pieces of the leac were said to be kept in the orchard of the glebe house of the local Protestant church until 1776, when the last of them was taken away. There was an ironic coda. O’Neill’s daughter Sorcha married a Magennis, one of whose descendants was Lady Glamis. In 1900, she had a daughter, Elizabeth Bowes-Lyon. Her daughter, in turn, is the current occupant of the British throne.